Allan Menezes was born and finished his schooling in Harare, Zimbabwe. He was a school record holder in athletics and represented his school and province in various track and field events. After school he went to the Albion, NY, USA as an exchange student where he broke school records in track and field and came 3rd in the Western New York State Championships. Menezes then went to England to complete a BA Equivalent with work in the Tourism Industry. Whilst at college he was Captain of the Volleyball and Basketball teams. He then went on to Canada to complete a Business Degree at Brock University, Ontario and was captain of the University Rugby Team. While studying in Canada, Allan injured his back in a rugby game – a deliberate kick to the lower back. The injury was so severe that he lay in a hospital bed for ten days and only allowed liquids for nourishment. The diagnosis at the time was a slipped disc. X-rays showed no abnormalities and no scans were taken. For the following two years Menezes attended almost every different practitioner he could think of who would have some hope of alleviating the pain. He then returned to England in 1981 to complete a Masters Degree at the University of Surrey in Guildford. Allan first discovered Pilates in London in 1982 while completing his thesis for his Masters. He loved what pilates was able to achieve for his back pain and requested to become an instructor and was accepted. After several months at the first studio, he moved on to the Alan Herdman Studios where he had some of the best grounding in the Method he had ever encountered. Alan Herdman is one of the Master Teachers of the Method who introduced Pilates into the UK. Menezes attended two hour classes every day for two years, seven days a week. After six weeks his back pain disappeared! He became an instant convert. A scan several years later was conducted on the lower back for the first time and an old herniated disc was seen on the images as a result of the kick years before. The one drawback in his training, was that Menezes’ original instructors had very little anatomical or athletic knowledge or training having come from ballet backgrounds. They could not explain the whys and wherefores of muscle mechanics and its application to Menezes as an ex-athlete. Allan then devised my own routines for improving squash, volleyball, etc. and programs for other fitness enthusiasts. These proved to be popular as more exertion was required and the routines became hard work. You could even sweat during these Pilates workouts!! In 1986 Menezes established the first Pilates studio in the southern hemisphere with the Body Control Pilates Studios in Sydney, Australia, using his Athletic Pilates(tm) System. In 1994, after setting up 2 more studios, he established the first true franchise of a Pilates studio. In 1996 Allan founded the Pilates Institute of Australasia. This was established to cater for the growing demand for quality training and to provide accredited workshops and courses in the Pilates Method. 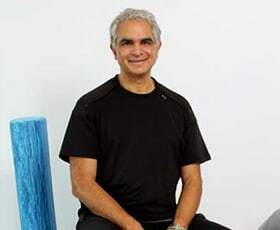 Menezes was also a founding member of the Institute for the Pilates Method of Santa Fé, New Mexico, USA, (now the PhysicalMind Institute) and was one of two non-Americans on its Advisory Board. In 1999 Allan wrote the bestseller, “The Complete Guide to the Pilates Method”. As the demand for Pilates continued to grow, he felt this will be an invaluable text for those wishing to reduce those niggling aches and pains and for those wishing to become familiar with the basics steps in sensible body maintenance and even those embarking on a career in the growing Pilates industry. This book is a basis of, not only perfection in movement, but also a requirement for the next step into exercising for physical rehabilitation. The book was used by the Institute for the Pilates Method and the Pilates Institute (UK) (no connection) as a theory manual for their students. It was also used as an exercise prescription manual for the Degree Course in Osteopathy at the University of Western Sydney. The book was reprinted in the USA in 2000 and in a second edition in 2004 with a Spanish edition in 2009. It is available on-line from the Pilates Institute as an e-book The two books Jo Pilates wrote, compiled into one volume, “Pilates – His Complete Works” by the Institute is also available from Pilates Online Shop. Allan and the Pilates Institute have also produced 13 DVD titles on the Pilates method.Some of these titles have also been reproduced in the USA, Germany, Turkey and other countries. Menezes also trained in New York in the Gyrotonic Method with Matt Aversi of Gyrotonic Corp USA and pioneered this method into Australia in 1998. Allan has also trained instructors from around the world and conducts courses in Brazil, Denmark, Singapore, New Zealand, USA and the UK. Those who have already trained in Pilates around the world in other styles have found Allan’s teaching still a challenge physically, and also mentally as his approach is so mechanically different and innovative, that they have to change what they have been taught. He was invited to present papers at a Sports Medecine Conference in May 2007 in Gothenburg, Sweden. Menezes has also worked with WeightWatchers Australia to produce a Pilates DVD and has trained the gym staff in Menezes Pilates at the Hilton Maldives Spa and Resort. Allan has also created many new movements and exercises, including the Menezes Position – a revolutionary new idea in greater abdominal connection. Menezes’ innovative style is such a common sense approach for today’s sedentary population and growing back and neck pain market, that the style of Pilates he has now created is so different from the rest of the world, he has decided to name it THE MENEZES METHOD. Allan lives in Sydney, Australia.